If you choose a public beach, you can naturally expect more noise and more of the locals to be present (a potential problem if you are a woman and want to wear less than a t-shirt and shorts); however, the public beaches can be accessed free of charge. On the other hand, choosing a private beach gains you access to quieter and usually cleaner shores-but for a price. Overall, Aqaba’s South Beach area is pretty clean, especially the private sections. It is a bit far from the city proper too, so there are times of the year and day when you find every beach on it to be rather quiet, free from the usual noise you would find in Aqaba. There are some absolutely fantastic views to be had on it if you are trying to catch a glimpse of Egypt’s Sinai Peninsula or Eilat, so bring a panoramic camera if you have one. Furthermore, if you dive or snorkel at all, be sure to bring your gear. Aqaba’s South Beach is popular for the superb diving and snorkelling opportunities in it that are made possible by the corals starting right at the beach itself. There is no need to swim all the way out to some island or deepwater location in this area: at parts of the beach, you step almost into the coral as soon as you hit the water, for the reef is right there. 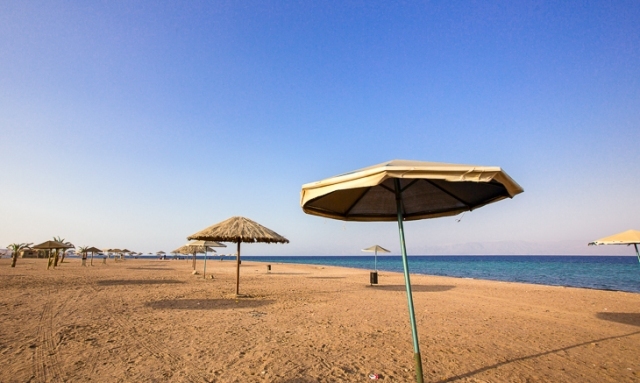 There are some things to take note of too if you do plan to visit Aqaba’s South Beach. For example, be warned that some of the showers are not very clean in the public beach areas. If you really care about that sort of thing, it may be best to go ahead and shell out the money for the private beach sections-it is not all that expensive when you consider what you shall be getting (including your own lounge chair for shade or sunning) for typically just under JD20. Note too that the sand is not very fine, so do not expect powder-like white sands when you visit the beach. It is wise to keep in mind that some areas of the beach might have more trash than others (be sure to slip on your footwear when you see this, just in case there are dangerous objects like broken glass mixed into the trash). Finally, be sure to try out some of the local restaurants near the beachside: several of these serve some excellent fresh fish dishes.